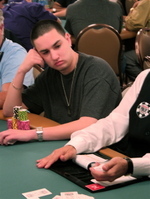 Only one of our Sweats played in Flight 1A of the 2006 WSOP ME: Donkey Hunter David Wong. Wong is a serious player, one of only 143 to play in the inaugural $50,000 H.O.R.S.E. event. So we were fairly confident, so long as he wasn’t totally cold-decked, that Wong would rep well. Talking to him, he’s a very cerebral player. Totally level-headed, realistic, and knowledgable. Wong didn’t benefit though from a table that just wasn’t giving much action early on, telling us, "It would’ve been nice if people had busted out earlier at our table. There would’ve been more chips to play with." It wasn’t all bad though, as he told us, "I hadn’t been getting called on my continuation bets. I don’t think I’ve showed down a hand." However, he just didn’t get the chance to play many big pots during the first few levels. "I haven’t had many big hands. And I’m not hitting flops. I don’t want to be like, "I’m not hitting any flops" but [laughs] I’m not making any big hands." 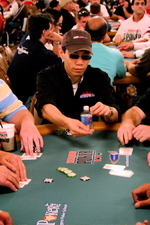 Wong still managed to stay in the 8k-10k range though until he lost "a few big hands," dropping him to around 4,500. Unfortunately, Wong was never able to double up and get back in the mix. He was eliminated during Level 4. There is one kid Wong noted to watch out for from his table. "He plays pretty big. He just turned 21 in April. Plays $25-50 no limit." The kid (at left), is running strong as of this writing, stacked around 40k. While it’s a shame Wong didn’t last longer, we have no doubt he’ll make a deep run in one of these major events soon. 2010 WSOP Main Event: Johnny Chan Still Among Chip Leaders Say What? !